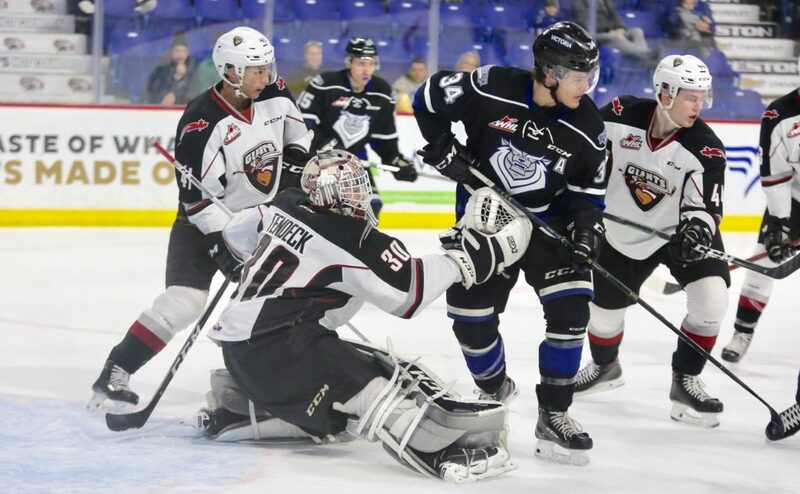 Tonight at the LEC, Round 2 of the WHL playoffs officially kicks off when the Vancouver Giants renew their heated rivalry with the Victoria Royals. These two B.C. Division rivals are meeting in the WHL playoffs for a second straight season, and after facing each other 10 times during the 2018-19 regular season, one of the two top teams in the B.C. 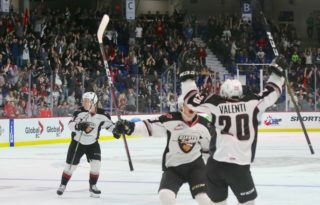 Division will be the last BC-based team standing in the WHL playoffs. The Giants are coming off a spirited six-game series victory over the Seattle Thunderbirds while the Royals prevailed in six games against the Kamloops Blazers. Game 1 goes tonight at 7:30 PM at the Langley Events Centre. 2000-born forward Phillip Schultz (Rõdovre, DEN) has enjoyed a strong rookie season in the Western Hockey League. Originally selected by the Victoria Royals 38th overall in the 2018 CHL Import Draft, Schultz finished his rookie campaign with 19 goals and 17 assists for 36 points through 60 games. So far in the playoffs, Schultz has been the offensive catalyst for Victoria posting two goals and seven assists for nine points in six games. Three of Schultz’s seven assists in Round 1 came via the power play, and one of his two goals was a game-winner as the Royals defeated Kamloops in six games. For his efforts, Schultz was named the WHL’s 2nd Star of Round #1. Four seasons. 196 regular season games. 26 playoff games. 114 wins. 10 shutouts. 22 career wins against the Giants. It really has been a superb WHL career for Victoria goaltender Griffen Outhouse who backstopped the Royals in Round 1 with a 2.63 goals-against-average, one shutout and a .923 save percentage. Last season against the Giants in the playoffs, Outhouse was 4-3 with an .898 save percentage and a 3.41 goals-against-average. He was 4-2-1-0 against them during the regular season this year with a 2.50 goals-against-average and a .925 save percentage. Earlier this week the WHL announced that Kody McDonald would miss the first four games of Round 2 after a stick-swinging incident that occurred in Game #4 of the first-round series with Kamloops. McDonald is a huge cog in the Royals wheel. During the regular season he notched 20 goals and 22 assists for 42 points and 104 penalty minutes. Prior to his suspension, McDonald had three goals through four games. 1999-born forward Davis Koch (White Rock, B.C.) is coming off possibly the very best calendar month of his WHL career. The over-age forward registered 24 points (5G, 19A) over the course of 14 games (regular season and playoffs). For his efforts, Koch was named WHL McSweeney’s Player of the Month for March. 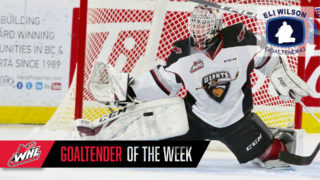 Koch was phenomenal for the Giants in their first-round series against the Seattle Thunderbirds. He led all Giants with a goal and nine assists for 10 points through six games of Round 1 and in that span also recorded three multi-point games and a +7 rating. Koch’s 10 points rank him tied for the WHL lead in playoff scoring. During the regular season Koch posted new career highs in goals (28), assists (50) and points (78) to once again lead all Giants. Koch also led the Giants in scoring against the Victoria Royals, posting three goals and 11 assists for 14 points and a +6 rating in 10 games against them. 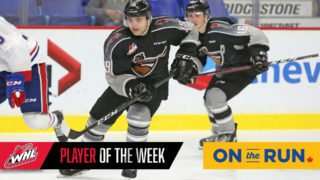 Bowen Byram was named WHL On the Run Player of the Week for the week ending March 31st. In four games last week, Bowen Byram secured two goals along with four assists for six points and a +7 rating. The Giants won three of those games en route to closing out their first-round series with the Seattle Thunderbirds. On Tuesday, March 26th Byram had a goal and two assists and was a +2 in a 6-4 victory for the Giants on the road. He was named the first star of Game 3. Then on Friday, March 29th at the LEC, Byram secured the primary assist on Dallas Hines’ game-winning goal early in the third period, lifting the Giants to a 3-2 win in a crucial Game 5. Byram followed that up with a goal and an assist in Game 6 and finished with a +4 rating as the Giants captured the series in six games. 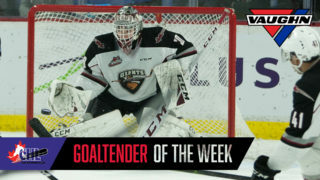 David Tendeck was 4-1-1-0 against Victoria during the regular season with a 1.80 goals-against-average, and a .921 save percentage and one shutout. Trent Miner was 2-1-0-1 against Victoria during the regular season with a 1.97 goals-against-average and a .919 save percentage. Milos Roman led all Giants with five goals against Victoria during the regular season. Dylan Plouffe led all Giants d-men with four goals in Round 1.